This week I had the privilege of participating in the 4th Annual South Asia Biosafety Conference (#SABC2016) , convened in Hyderabad, India, and organized by the South Asia Biosafety Program (SABP), Biotech Consortium India Limited (BCIL), and the ILSI Research Foundation. The organizers kindly asked me to present a talk on communications to the group --- as it turned out, the last scheduled talk of the last session on the last day of the conference! Why do we always leave the topic of communications to the end of our meeting/conference call/grant proposal? I made the case that we mustn’t leave the work of communication and outreach to the end of our project, and shared ways to build strong messages that start with ‘why’, visibility, allies and issue management, all to reduce risks from start to finish. But for three days of incredibly diverse talks before that, each session expanded my own understanding of biosafety concepts, trends, and challenges. Biosafety is all about identifying, assessing and managing potential risks from biological research and development. In the case of agricultural biotechnology, this includes safety for human and animal health (that is, food and feed) as well as environmental safety. 1. Biosafety anywhere can help biosafety everywhere. Updates on the status of biosafety across South Asia were complemented by presentations on biosafety policies, systems and experiences in SE Asia, South Africa and Kenya. This gave us all a more complete sense of how concepts and best practices are evolving, and new ideas for ways to address similar challenges. For example, Abe Manalo’s review of recent twists and turns in the Philippines' biosafety system and Osman Mewett’s talk on Australia’s combination of federal and state policies both gave hope for others on similar regulatory adventures. Hennie Groenewald’s description of how South Africa’s regulators, technology providers and farmer worked together to make refuge requirements a reality was also of great interest. 2. Biosafety isn’t just for GM plants. Dr John Teem talked about GIANT SNAILS! 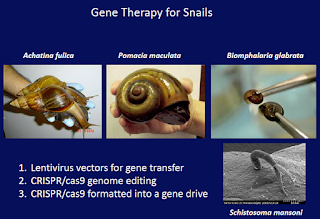 I’m a confirmed plant nerd, but it was fascinating to hear how researchers are developing new ways to stop the spread of invasive species (GIANT SNAILS!! ), protect important industries (silkworms) and stop the spread of disease (mosquitos). Walking us through the safety considerations related to each of these benefits gave a fresh perspective on why and how we address these issues in the first place. 3. Biosafety has to keep up with new advances in research and development. So-called ‘new breeding technologies’ look like they’re going to deliver important new benefits for agriculture. This week I made more progress in my personal quest to really understand what gene-editing, gene drives, CRISPR cas9 and other new tools are all about. I’ve been communicating about GM technology for two decades now, and if I struggle to track the new stuff and find ways to explain it to others, imagine the challenges facing regulators around the world! The science says these new technologies may have even less potential risk than the older transgenics, but they still need to be properly assessed. And in the meantime, GM products in development and in the ground still have enormous value and shouldn’t be abandoned (the story of the virus-resistant plums is especially compelling). Other highlights included learning about story-centric approach to writing regulatory dossiers, my first visit the International Crops Research Institute for the Semi-Arid Tropics (ICRISAT) and sharing a panel with Director-General Dr David Bergvinson, catching up with dear colleagues from past projects, and meeting new friends over delicious plates of briyani (and a long bus ride or two). My talk and most of the others are online now. Please explore and support the work of SABP as they help scientists and regulators in India, Bangladesh and other countries build their research tools, training, policies and networks. It’s all about using new agriculture technology to safely benefit economic and agricultural development, international trade and environmental sustainability -- and those most in need.